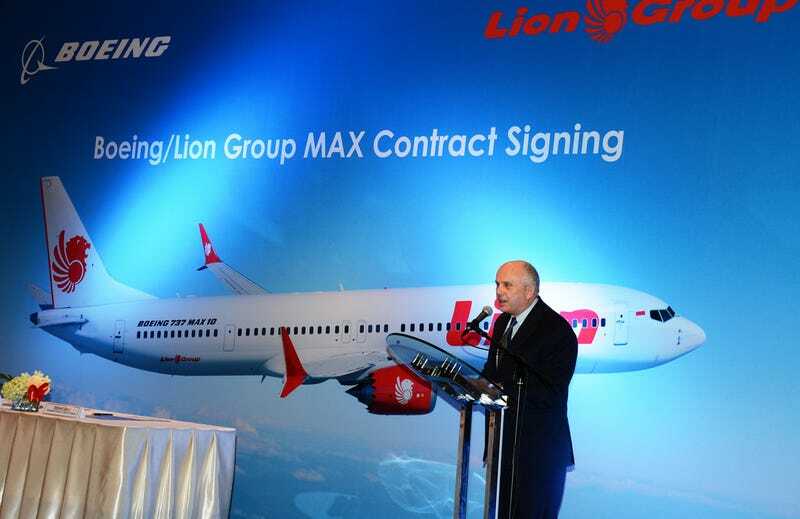 United States Ambassador to Indonesia Joseph R. Donovan Jr. speaks on partnership between Boeing and Lion Air on 10 April 2018. People purchasing $100 million-plus aircraft have the same predicament, or more accurately, they used to. This certainly sounds bad. Boeing sold a safety feature that could have saved hundreds of lives, let alone their reputation, as an optional extra? But optional extras aren’t free, and airlines, like any other fleet buyer with a vicious accounting department, will cut options to save money. This is especially true for low-cost carriers in the Global South catering to leisure travelers. You wouldn’t find these optional extras for the same reason you wouldn’t find adaptive cruise control on a U-Haul truck. Maybe wouldn’t trust your family’s life to such a truck. Or maybe you would rent from a more-expensive competitor, or lobby the relevant regulator to mandate such features on trucks. Those are the three available strategies to solve the current problem and allow the Maxes to fly, and all three come with a different risk assessment. First the airlines. When buying a nine-figure airplane, why not check an option box, especially for a safety feature? Especially Lion Air, which has a well-earned reputation for breaking airplanes. They didn’t see the risk; how different could it be from other 737s? Employers expect employees to know many things. Based on reports of the Lion Air pilots frantically reading a manual while falling from the sky, no one verified that expectation. The airline could make this situation a memorized procedure, as they do with other critical phase of flight emergencies such as losing an engine during takeoff, but they didn’t pay for that either. Then we have regulators, the people entrusted by the public to keep us all alive. They certified the airplane, with or without the optional features. They could mandate training, simulator or flight, requiring pilots to recover from pitch-down events. They could mandate training on simulators that replicate the MCAS failure (current simulators lack that ability). But Boeing, and foreign airliners, can remind regulators that their power only exists in their airspace, and they cannot mandate their rules assessment on the world. If the Indonesian Directorate General of Civil Aviation doesn’t mandate the optional extra, why should the American Federal Aviation Administration force Boeing to make it standard? The FAA could reply that every Boeing is a symbol of American industry, and people dying in American aircraft hurts American interests, but they didn’t. Finally, the party that made the option an option, the manufacturer. These optional hardware and software features are not free to make, test, and maintain. Some airlines will pay this cost, and others would rather walk to Airbus then pay for something supposedly frivolous. Boeing could have made the features standard, raised the list price, and told some airlines to take a risk on Airbus. Hopefully Sully is in the cockpit when the plane decides to save the engines over the passengers. Of course Boeing gave everyone the optional extra, after two crashes and hundreds of lives lost, for free. The accident investigations are continuing, and American criminal and congressional investigations will soon begin. This story will get bigger in the upcoming weeks, and I won’t try to speculate on what will develop in these specific cases. I will speculate on what it means for everyone else, especially the automobile industry. Like the 737 Max, many cars have installed hardware supporting optional safety features. Most famously, every new Tesla famously has cameras for self-driving features, which customers may use if the buy the software. One day, a driver that did not buy the software will die, or kill someone, in a crash the software would have prevented. We will compare accident and fatality rates between cars with and without the optional extra, and ask why it isn’t standard. Hopefully our risk assessments include those eventualities..